A motorist found the baby boy on Interstate 275 in Tampa, Florida, around 4:30 a.m.
(CNN) -- A Tampa judge denied bail Wednesday for a Florida man charged with first-degree murder in the death of a 3-month-old child, who authorities say was thrown out of a moving car. 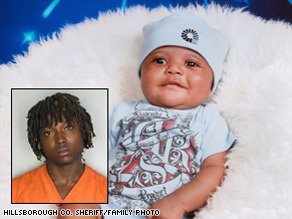 Police say infant Emanuel Murray died after his mother's ex-boyfriend threw him from a car on a Florida interstate. Richard Anthony McTear Jr., 21, was arrested Tuesday, hours after a confrontation at his former girlfriend's apartment in which he snatched the infant, Emanuel Wesley Murray, the Hillsborough County sheriff's office said. "It had to be a baby doll but it was too big to be a doll," Bird told CNN affiliate WFTS in Tampa. "I almost passed out, I started shaking," said Bird. A preliminary autopsy determined the child died of blunt trauma to the head, the county medical examiner's office said. Police were called to the apartment of McTear's former girlfriend about 3:15 a.m. Tuesday. The mother, Jasmine Bedwell, 17, told investigators that McTear had hit her several times and threatened "to kill the both of y'all," the sheriff's department said in a statement announcing the charges. McTear threw a car seat containing the child across the room during the fight, causing the boy to fall onto the apartment's concrete floor, investigators said. He then picked up the boy and drove off in his blue Chevrolet Impala, throwing the child out while on the interstate, the sheriff's department said. Video on CNN affiliate WFLA TV showed McTear being led out of a Tampa police squad car after his arrest. He ducked his head as TV cameras surrounded him on his walk into a police building. When asked by reporters if he had thrown the child out of the car window, McTear answered, "It's a dirty game. A dirty game." McTear is not related to the child, said sheriff's spokeswoman Debbie Carter. McTear is facing additional charges of burglary with battery, felony battery, aggravated child abuse and kidnapping, the sheriff's department said.